Binghamton’s sixth-annual Research Days will take place April 19-21. 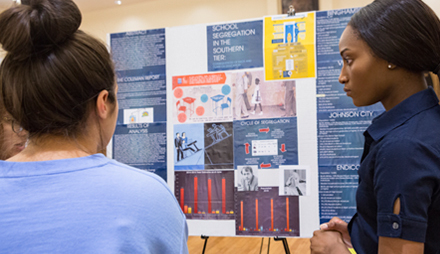 The event, designed to celebrate research, scholarship and creative activities across campus, will again feature student poster sessions, special lectures and tours as well as workshops. Another new event is an Art of Science competition, sponsored by the Office of Research Advancement and the Center of Excellence. Faculty, students and staff have submitted images that represent their research in some way. Select entries will be on display during a reception from 4-6 p.m. April 19 at the Center of Excellence Atrium. Binghamton Research Days are sponsored by Academic Affairs, the Division of Research, Louis Stokes Alliance for Minority Participation, McNair Scholars Program and the Undergraduate Research Center. Research Days has become a campus tradition, but McDonald notes that the organizers continue to adjust the programming. She also looks at the outcome of the activities each year. For more details about Binghamton Research Days and a full schedule of events, visit http://go.binghamton.edu/researchdays.